CULVER CITY, Calif. (July 18, 2017) – A must-own for film fans and adventure-seekers alike,Sony Pictures Home Entertainment debuts THE BRIDGE ON THE RIVER KWAI on next-generation 4K Ultra HD for the first time October 3 to commemorate its diamond anniversary. One of the crown jewels in the Columbia Pictures catalog, the release also includes the existing Blu-ray™ with incisive special features and historical context, making it the perfect holiday gift. 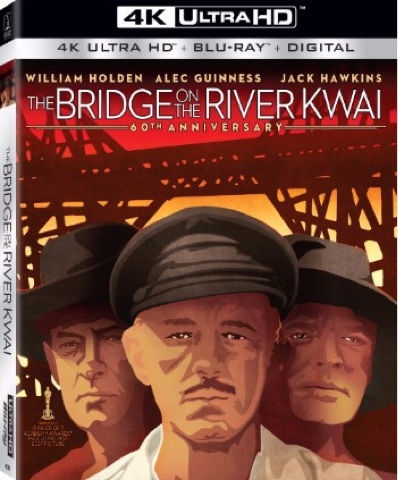 Fully restored in 4K resolution and presented with High Dynamic Range (HDR) and Dolby Atmos audio, THE BRIDGE ON THE RIVER KWAI won seven Academy Awards®, including Best Picture, Best Director (David Lean) and Best Actor (Alec Guinness. )* William Holden also stars in this epic WWII drama of POWs in Burma forced to build a bridge to aid the war effort of their Japanese captors. In 1997, THE BRIDGE ON THE RIVER KWAI was deemed “culturally, historically, or aesthetically significant” and selected for the National Film Registry by the United States Library of Congress. The American Film Institute included it among the best American films ever and in 1999, the British Film Institute voted it the 11th greatest British film of the 20th Century. 4K Ultra HD is the perfect way for fans to immerse themselves in this iconic classic. The 4K Ultra HD features four times the resolution of high definition, high dynamic range (HDR)--which produces brilliant highlights, vibrant colors and greater contrast on compatible displays--and Dolby Atmos audio, remixed specifically for the home theater environment, delivering captivating sound that places and moves audio anywhere in the room, including overhead. When British POWs build a vital railway bridge in enemy-occupied Burma, Allied commandos are assigned to destroy it in David Lean’s epic World War II adventure THE BRIDGE ON THE RIVER KWAI. Spectacularly produced, THE BRIDGE ON THE RIVER KWAI captured the imagination of the public and won seven 1957 Academy Awards®, including Best Picture, Best Actor (Alec Guinness), and Best Director. Even its theme song, an old WWII whistling tune, the Colonel Bogey March, became a massive hit. THE BRIDGE ON THE RIVER KWAIcontinues today as one of the most memorable cinematic experiences of all time. THE BRIDGE ON THE RIVER KWAI has a run time of approximately 161 minutes and is rated PG for mild war violence.